When it comes to looking for quetzals in Costa Rica, most people head to the isolated cloud forests of Monteverde; a four-hour journey from the Central Valley on windy, partially-unpaved roads. The lesser known-spot is buried in Costa Rica's pristine mountains of Cerro de la Muerte, a mere 90-minute trip from San José. In a breathtaking valley known as San Gerardo de Dota, a plethora of the quetzals have made their home, feeding off the wild advocate or aguacatillo. Once considered divine by Pre-Columbian and Mesoamerican civilizations, these red-breasted birds, with magnificent colorings and long, majestic tails, have developed quite a following among birdwatchers and casual sightseers alike. The best time to see the quetzal is in the dry season, which lasts from December to April. But if you are lucky and have patience, you can find them at any time of the year. 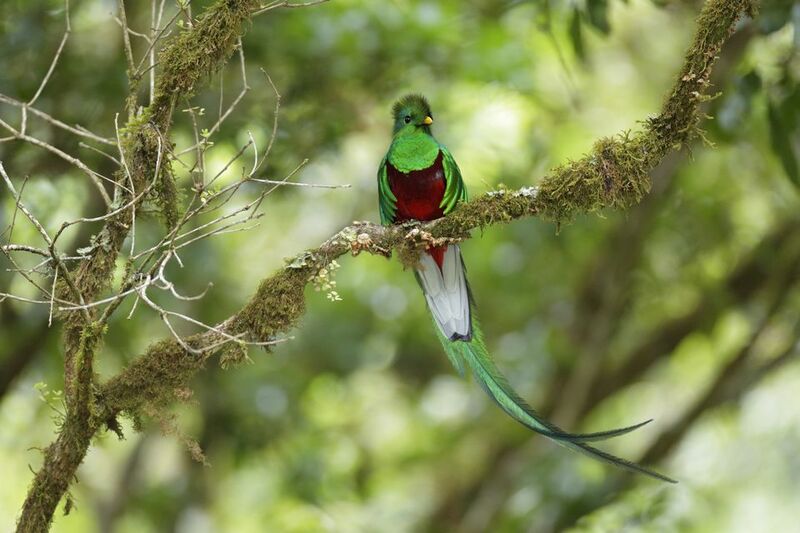 Because quetzals are best seen in the early hours of the morning, most will stay the night at one of the area hotels. Tours can be booked by the front desk at most hotels. Prices range from $16 (call Dantica, Tel: 2740-1067) to $55 (call Savegre Mountain Hotel, Tel: 2740-1028). If you are not much into quetzal-hunting, the San Gerardo de Dota valley is worth a visit on its own. With lush primary forests blending into green orchards, contrasted by a refreshing mountain stream, it’s an idealistic setting for a weekend retreat. Visitors can enjoy a hike down to the stunning Savegre River Waterfall; a middle-of-the-road hike in terms of difficulty. It’s mainly flat walking but gets very steep the last 25 meters. There are also nature guides available for this walk. Rates range from $40-$70 for a half day. A tour by horseback costs $12 an hour with a guide. The folks at Savegre Mountain Hotel (Tel: 2740-1028) can arrange this tour. At Trogon Lodge (Tel: 2293-8181), there’s a 10-platform canopy tour, which costs $35 per person. Walking tours either in the Cerro de la Muerte (around $35) or in the Quetzal National Park (around $47) are also options that can be booked at any hotel. A coffee tour with the first coffee to go carbon neutral – Café Dota – is a short drive away in Santa Maria de Dota. Transportation (for an additional $70) leaves San Gerardo de Dota mid-morning. The tour alone costs $39. Call Dantica (Tel: 2740-1067). The valley was first settled by the Chacon family in the 1950s, which sustained themselves on dairy cattle, trout and fruit trees. When the quetzal was ‘discovered’ in the high-altitude cloud forest, a tourism industry quickly arose and small hotels sprouted in the folds of the mountains. The Savegre Mountain Hotel (Tel: 2740-1028), also known as Cabinas Chacon, is still maintained by the Chacon family. The rooms are simple and the food is basic, but the lush gardens encourage visitors to enjoy the outside. Room rates per night begin at $94. Cozy, lodge-like rooms surround magnificent gardens at Trogon Lodge (Tel: 2293-8181; www.grupomawamba.com). This is considered one of the nicer options for the area. Overnight rates are between $83 and $134. For a more modern experience, look for the Dantica (Tel: 2740-1067), with white-walls, chic furniture, and huge glass windows. Rooms range from $126 to $178 a night. Hotel de Montaña del Suria (Tel: 2740-1004) offers simple accommodations and is set deeper into the valley, but with great access to hiking trails. Also look for Hotel Las Cataratas (Tel: 8393-9278 or 2740-1064), El Manantial (Tel: 2740-1045), and Sueños del Bosque Lodge (Tel: 2740-1023). Cabinas El Quetzal (Tel: 2740-1036) offers an incredible all-inclusive package for $63. Because hotels, restaurants, and attractions are spaced far apart, it’s highly recommended to arrive in a car. To get there, take the Interamericana Highway south from San José, following signs to San Isidro de General or Pérez Zeledón. San Gerardo is a right turn about 90 minutes outside of the city at kilometer 80. It’s easy to miss so keep on the lookout! If you are planning to arrive via bus, it’s best to notify the hotel you are staying at ahead of time so they can pick you up. Otherwise, it’s at least a 9-kilometer hike downhill. You can take the indirect bus to San Isidro de General from the MUSOC bus station. Make sure you tell the ticket salesman and the bus driver that you want to get out at kilometer 80 at San Gerardo de Dota.